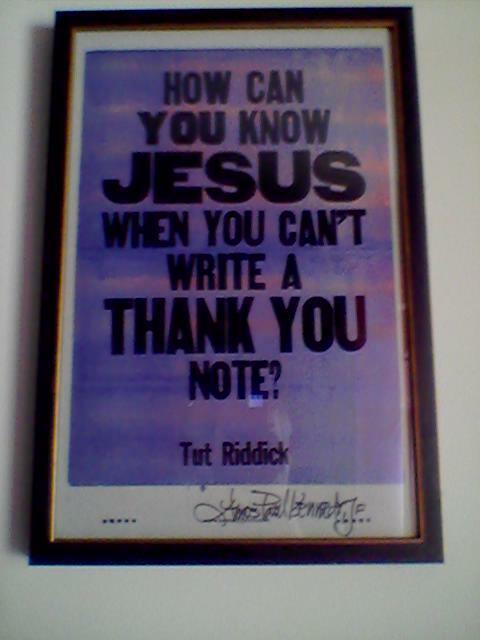 The first time I saw Amos Kennedy’s letterpress poster print containing the quote “How can you know Jesus when you can’t write a Thank You note?” I knew it belonged on my wall. The quote is attributed to Mobile-based artist-collector (and sage) Tut Riddick and it had immediate resonance with me. The late George Carlin had a whole routine about phrases he considered to be oxymorons – “military intelligence,” “business ethics,” “jumbo shrimp,” and “young Republicans” were on Carlin’s list, as I recall. I might put “compassionate conservative” in the category. The interaction done under the label of “social media” seems too often to be the death of appropriate social engagement and courteous exchange. Things done in the interest of saving time too often come across as thoughtless and inconsiderate. I don’t fault the technology for this. Instead, I fault the users who use social media as an excuse to take shortcuts and minimize opportunities for true meaningful contact. I suspect that if more people realized that the same rules that apply to effective written communication apply to online media, we would see less of a decline in essential communication skills. This is an ongoing concern for me as a teacher, as a reader, and as a writer. One can be literate and courteous through social media outlets but too often those who depend on such outlets for their primary social contact rely on shortcuts, sub-literate constructions, and curtness bordering on rudeness. Or they forward a cute cat picture or something someone else said and think that they’ve made social contact. Over the years, my stock reply when I was asked why I don’t have a Facebook account was “because I’m an adult.” Nowadays my students scoff at the mention of Facebook; they’ve all moved on and see Facebook as the domain of their parents and grandparents. I can’t say I was ahead of the trend – I was just totally disinterested. But even with the preponderance of media outlets, I don’t know anyone who doesn’t still appreciate a thoughtful handwritten “thank you” note or letter, even if they can’t muster the wherewithal to write one themselves. The irony is, whenever somebody tells me they don’t have “the time” to write thank you notes, I am thinking that it doesn’t really take that much time. I can usually get a proper thank you written and posted in under five minutes. I make a point of having good stationery and postage stamps on hand and when the occasion arises for a thank you note to be sent, I try to get it written and posted within 24 hours (otherwise, like most everybody else, I will forget about it). Only a few sentences are needed; say enough to let the recipient know that you know why and to whom you are writing. Simple and succinct is fine. It’s a civilized and gracious thing to do and I guarantee you’ll feel good when you do it. Even better, the recipient will value and remember the gesture and may even pass it on. This entry was posted in thank you notes and tagged Amos Kennedy, George Carlin, social media, thank you notes, Tut Riddick on April 15, 2015 by gedwardjourney.